Reader Bob Christmann reached out to share some great “fish stories.” I think you’ll enjoy this guest post of his. Bob says people are welcome to contact him; his Yahoo! email is bobhc1. We all have memorable fish we’ve caught. Usually, it’s because there was something that was unique about the experience that made it really stand out. After 54 year of fly fishing, I have at least three. The memories of these catches will be forever burned into my mind (or, at least until I come down with Alzheimer’s). I was fishing the Taylor River in Colorado below where it flows out of the Taylor Reservoir. It is known for its large concentration of trophy trout in the catch and release section. They call it The Hog Trough. The water is broken enough on the surface so that you can’t see very far down. But, what really gets the pulse beating is the large dark shadows down deep that you can see moving back and forth: fish. Big fish. There was nothing rising, so I spent the morning methodically moving upstream from the bridge, trying every nymph I could think of with my nerves getting a bit rattled thinking about all those big shadows and with no luck. It was only when I tied on a #16 San Juan Worm that my indicator finally dove under, and I had a good one on. It took me about 200 feet downstream before I finally landed him 10 minutes later. He was a heavy and strong 22” rainbow, my personal best ever. I noticed it had an odd white shaped mark on its back. I went back upstream to where I hooked it and slowly worked my way back downstream. At about the area where I released the first fish, I got another hit on my worm. After a good five-minute fight I pulled it in and to my amazement it was the exact same fish as before with the funny white mark on its back! That thing sure liked my San Juan. My best trout ever taken in my life, twice in the same afternoon. What are the chances of that? Work was delayed for a day. So, I decided to go up to the Williams Fork Reservoir near Parshall, Colorado. Good choice. The reservoir has good trout and Kokanee Salmon, but is also known for its big Northern Pike. My plan was to fish the reservoir in the morning where I had previously taken a small salmon, then fish the river below where it exits the dam for the afternoon. I dug through my pack to put on a reel with 20 lb. test tippet in case I hooked into a pike, only to discover I had left it in my truck 10 minutes away. So, I put on my reel with 4x tippet. No big deal. I was just going to catch some trout. Right? I worked my way along the edge and came to an area where it quickly dropped off deep. I was using a Woolly Bugger, slowly twitching it along back to me when I saw in the calm, clear water about six feet down an enormous head follow my fly, matching its movement. Somehow, I didn’t panic. I twitched the fly forward, and the fish moved forward. I twitched again, it moved again. From years of Smallmouth Bass fishing, I’d learned that if you twitch a leech along and a bass is following it, if you just let it sit still, it will often come right up and inhale it. I decided to try this trick and sure enough, he came right up and inhaled it. All could do was hold on for dear life because this enormous head was attached to a 36” Northern Pike, and he was taking off. I hoped I had enough backing. He was in control, not I. And, remember that I only had 4x on expecting to just catch trout. I checked my watch as I knew this could be an epic battle if he stayed on. It was like hooking a submarine. I couldn’t even think of horsing him in on 4x or possibly risk breaking my rod. The power of this thing was immense, no exaggeration. Fortunately, its runs weren’t too long. I was able to keep pulling him back in at my feet and to lay my rod beside him to get a good measurement. But, every time I touched him, he would bolt and start a new run. My dilemma was I had to somehow cradle him with one hand to keep him still while trying to get forceps into mouth to extract the fly, and, at the same time, keep a hold on my rod so he wouldn’t take it with him across the lake the next time he bolted. I soon realized that it was just too big to try and lift like you do a trout. My biggest problem now was how to land this powerful thing that was showing no sign of tiring. Think about it. How would you land a 36” pike with razor teeth that would shred your hand in a second with one wrong move when all you’ve ever landed is mostly 20” trout tops? I really had no idea. After many attempts, I finally decided I would have to try grabbing it by the gill plate, and, when I did, it made one last flip and my tippet finally gave up the ghost. He was gone. My fly was regretfully still stuck in his mouth but I just couldn’t get at it. The battle lasted 20 minutes and both sleeves on my shirt were totally soaked. The only reason it stayed hooked for so long (besides my incredibly deft handling of the situation–yeah, right) was that the tippet was caught on the back corner of his mouth where his teeth couldn’t get at it to cut. Quite the testament to my Orvis Super Strong Tippet. I was enjoying a beautiful day on the White River in Vermont, fishing for smallmouth bass. I worked my way up to one spot where the river sweeps around a bend, forming a magnificent, deep pool with plenty of good casting room. After working the pool for a while with a Woolly Bugger, I hooked a real good one. It looked to be about 18”. It was a great battle, and I eventually brought him to me. He was pulling hard, I was pulling hard. Lots of tension on the line. If you’ve ever had an 18” smallmouth on a fly rod, you know how hard they can pull. When I finally got it up to my feet, I distinctly remember seeing an almost angry look in his eye as if to say “You’re going to be sorry for messing with me”. And I was. As I was reaching down to grab his lip, (I had no net) the hook flew out of his mouth like a slingshot straight into my thumb. I was sure glad I crimp down my barbs. I’ve caught many fish in my life, but this was the first and only time a fish caught me. And, I’m glad he practiced catch and release. 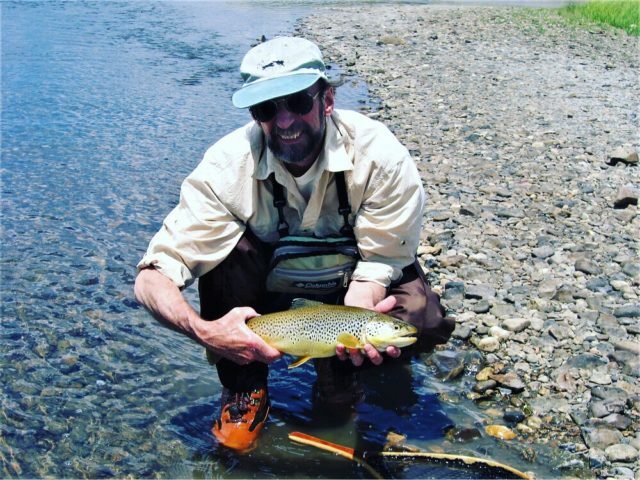 I grew up in eastern Massachusetts and have had a passion for fly fishing and fly tying since I was 15 (am 69 now). Back then, good materials were hard to find and afford. My first creations were pitiful. After graduating from high school, we moved to Vermont. I spent the next 22 years roaming the rivers there, sharpening my skills. My brother (who has since passed away from cancer) helped me perfect my tying with flies that were now perfect. We spent many days on the rivers and many trips backpacking to rivers in Idaho, Montana, Yellowstone. When the recession hit in 1993, all my work as a carpenter dried up, and we moved to Colorado for six years, where there was lots of work. 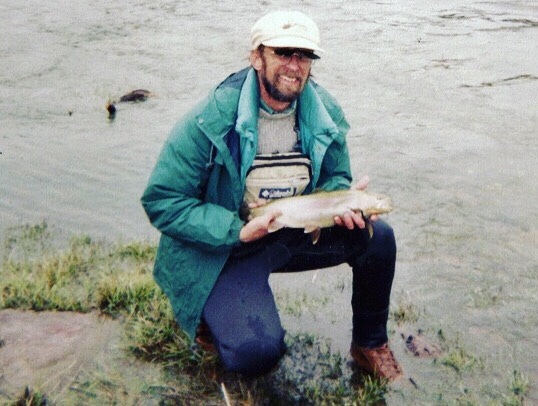 During that time, I had the great privilege of fishing some of the great rivers of the west: the South Platte, Taylor, Frying Pan, Colorado, Blue, and Green rivers, all of which had spectacular scenery. They were the best years of my life, catching my best and most fish ever. We moved back to Mass. in 1999, but back problems eventually got the better of me (that’s why you don’t see too many old carpenters), and I was forced to give it all up for 15 years. Just too painful to cast for very long. Those were dark frustrating years for someone who loves fly fishing. But with recent supplements I’ve been taking, all my arthritis is gone (yes, you CAN cure arthritis), and I am now eagerly back at it. Too much lost time. I used to be able to go all day and into the evening with energy to spare but not anymore. So, I’ll take what I can now. I currently live in Northfield, MA, making it convenient to jump over to the Deerfield or head up to Vermont. Great stories Bob! Thanks for sharing! Great stories!! How come I’ve never heard these before?!!! Love from your older sister!! !